Liquid Democracy is direct democracy by proxy vote. In a Liquid Democracy each citizen has the power to vote directly on each decision and make proposals, but can also delegate their vote to a proxy if they choose not to vote directly. In a Liquid Democracy, those citizens that want to get involved in politics can do so and those who would rather delegate their voting powers to a proxy can do so as well. This way, each person can decide on their level of political involvement. The system makes it possible for anyone to become a proxy as long as they disclose their voting intention to the public. 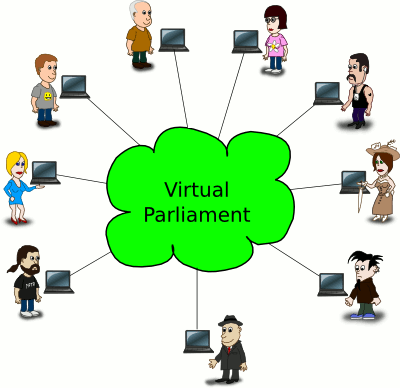 Likewise, any citizen or group of citizens can create a virtual proxy, which will publicly disclose the voting intention of the political party or opinion group it represents.